In 1979, Frank received a grant from the National Endowment for the Humanities for his "Puerto Rican Diaspora Documentary Project", which took him all over the country documenting the Puerto Rican migratory experience in 34 locations in the mainland, Hawaii, and Puerto Rico. The resulting exhibit was shown in 45 venues over a 15-year period. 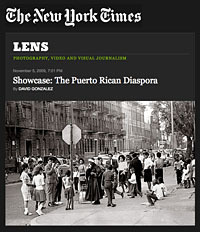 A book of this work, The Puerto Rican Diaspora: Themes in the Survival of a People was published in 2006. The book has received numerous book design and printing awards since its publication. • In 2008, "in recognition of his distinguished record of personal and professional accomplishments and service to society" Frank was awarded a Doctor of Arts degree from Lehman College in the Bronx, New York. • In May 2009, the Library of Congress purchased a collection of 83 vintage prints from the "Puerto Rican Diaspora" project. • In 2010, Duke University proposed to develop an archive of Frank's lifetime work. Click here for more information about the archive at Duke. The great majority of Frank's exhibits were the result of the documentary project. However, some of them encompassed a broader selection of his work. Amongst these were the exhibits at the Charles Allis Art Museum in Milwaukee; at the Reading (Pennsylvania) Public Museum; at Honolulu Hale; the Museum of Art in Chicago; the Museo del Barrio in New York City; and at Museo de Arte de Ponce, in Puerto Rico. All of these were from 1982 to 1985. Frank Espada and "The Puerto Rican Diaspora"